For the first time ever, renowned Australian artist Patricia Piccinini is taking her hyper-realist, fantastical creatures outside the museum. The intimate setting of a wing of 18 rooms in Strathcona’s historic Patricia Hotel will be transformed for the Curious Imaginings exhibition. The Vancouver Biennale Young Ambassadors would like to invite you to attend a private guided tour of this exciting exhibition on Saturday, October 13. The private tour of the Curious Imaginings exhibition starts promptly at 6pm and is located at the Patricia Hotel (403 E Hastings St) . Please join us after the tour for a meet and greet (and drink!) next door at Pats Pub. To purchase tickets, visit our page on Eventbrite. The Vancouver Biennale Young Ambassadors invite you to an artsy journey throughout Vancouver. 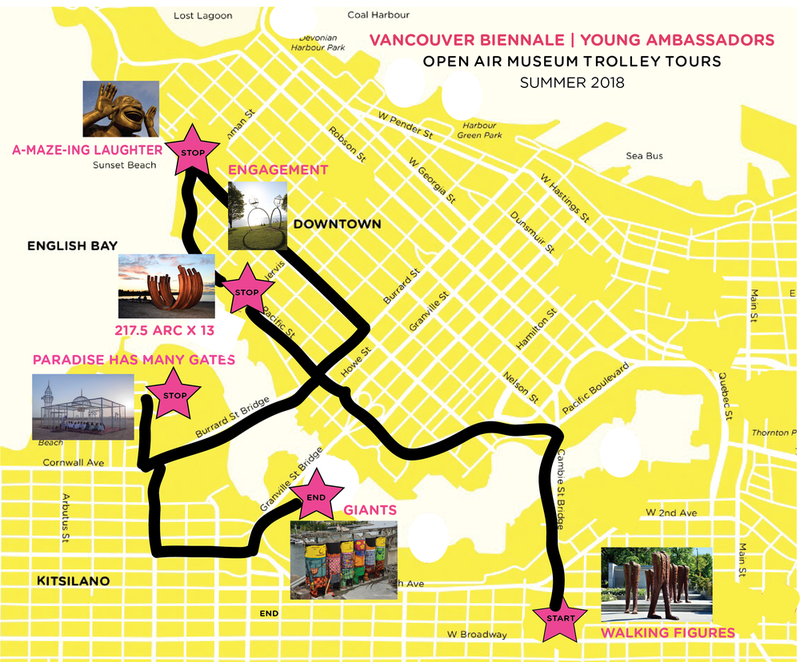 Its first Trolley Tour will take you around the city, stopping by iconic Vancouver Biennale public art installations spread around English Bay, Vanier Park, and Granville Island. It is a unique opportunity to engage with young professionals while learning about art – and finishing off with a well-deserved pint of beer. Want to join? You can buy tickets here. Want to invite friends? Here's our Facebook Event. Tickets can also be purchased at the Walking Figures installation before the tour with cash or credit card.